The trio of Hevelius, Lohrmann, and Cavalerius were the first to catch my eye along the terminator tonight. After a quick tour near the terminator, I settled on the trio and their surrounding area for a closer study. Grimaldi’s western rim was etched south of Lohrmann and had begun to fill with sunlight creeping over the waxing edge. 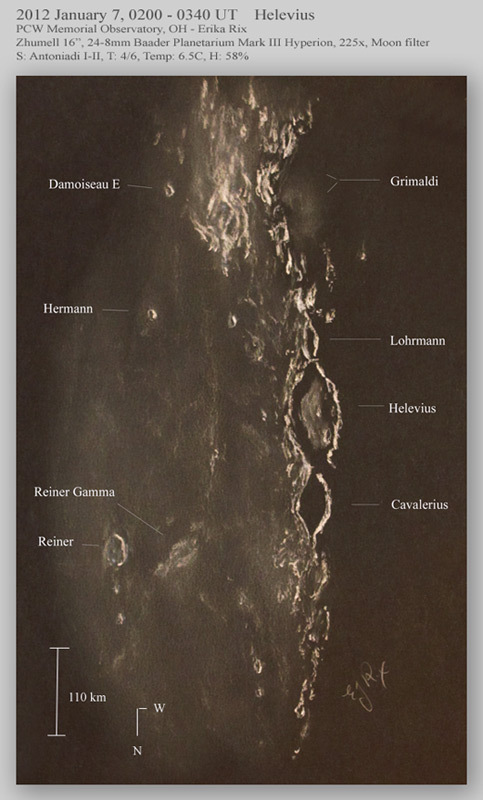 The small central mountain of Hevelius and crater Hevelius A were spotted easily and the only hint of Hevelius rimae was a softened dark line reaching north to south just east of the central mountain. I didn’t realize it was even there until I came inside after my session and compared my sketch with an atlas of the area. The tormented outer slopes of the crater chain were very clear and sharp, making them very enjoyable to study and even more so to draw (in my feeble attempt to capture all the detail as accurately as I could). Cavalerius was completely filled in with shadow. The fantastic find of the night was the Hevelius D 1 (dome) along the wrinkle ridge between Reiner and Hevelius. Reiner and Reiner Gamma were added as the sketch progressed, as they were too tempting to leave out. WOW!! I’m without words….I made this zone 3 or 4 years ago…Beautyful sketch! Heveluis, your sketch is a mix of talent, beauty and… realism. We see all the quality of what a astronomic sketch can give. It is BEATIFULL. It is like if we suround the moon. Congratulation !!!!!! Previous Previous post: Maurolycus & Co.